There is nothing better than watching a movie that’s not only based on a true story, but on a story that revolves around kind human beings who never hesitated to put their life in danger to save others. 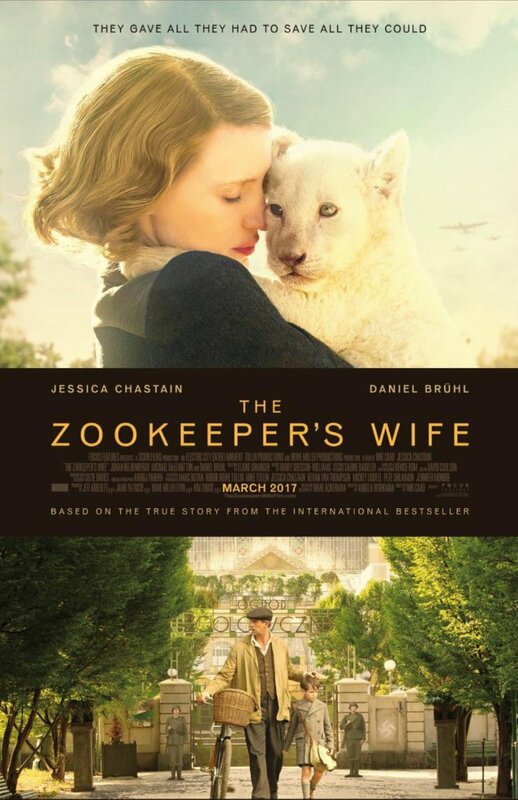 The Zookeeper’s Wife tells the story of Antonina (Jessica Chastain) and Jan Zabinski (Johan Heldenbergh), whose nearly 300 “guests” were hidden in the Warsaw Zoo during the German Occupation. Luckily, most of them survived, which makes the Zabinskis’ effort even more sweet and worthy. Yes, this was a test not to check your survival skills, but integrity and conscience, which the Zabinskis’ had overwhelmingly a lot. The film begins with the Zabinskis, when we find them enjoying their life as Zookeepers of a Warsaw Zoo. It’s 1939, a year before the WWII is to begin, but Antonina makes a very important acquaintance with a German scientist, Lutz Heck (Daniel Bruhl), whose friendship will be tested during the way, but will be surely define their future as well. However, when the War begins, that charming man turns into a two-legged evil while Antonina and Jan use their Zoo to save as many lives as they can, both human’s and animals respectively. As you will analyze the title of Niki Caro’s wonderfully directed and flawlessy narrated film, you will stop wondering somewhere in the middle of the film, as you find Antonina’s role very crucial, not only involving herself into Polish Underground Resistance, but trying to use her feminine side as well to hold back a now-Nazi officer Daniel Bruhl who wrongly believes that Antonina is interested in him. While he thinks that way, Antonina and Jan keep bringing and hiding people in their villa, protecting themselves and Jews from getting killed. The Zookeeper’s Wife is an endless joy to watch, but full of suspense. If you have not heard about the Zabinskis’ story, this movie will make you anticipate any ending, based on circumstances. But what it does the best is have such an incredible ability to grab the viewer’s attention all the way through the big screen. Some nail-biting scenes will make you to sit on the edge of your seat. It’s truly amazing to see how Angela Workman adapted the screenplay from Diana Ackerman’s book, where you can see from the performances of actors, who simply shined in every single scene. In addition to that, The Zookeeper’s Wife can literally lift your spirit and mood. Because, as you watch the movie based on a true story, it always appears as a mystery how can one sacrifice everything and not use an opportunity to leave occupied Warsaw because of the Zoo? But the thing is, when this touches personally and becomes a matter of dignity, respect and distinguishing between the right and wrong, Antonina and Jan Zabinski were true heroes of war. They saved many lives during the most difficult time. And what is more important, it was well documented in this film, trust me, you will love from the bottom of your heart. It’s profound, touching and beautiful movie, I am so sure, you would not like to miss. Because there are not many people left like the Zabinskis’, and there are many more we yet need to hear about… I wish, we will one day…. Enthusiastically waiting for this movie… i really need to watch this now in this moment in my life! Thanks Ulkar for wonderful review. Respect from bottom of my hear! Sanjida, thank you for your comment. This is really good movie and I am sure you will love it.